For the Indian Cooking Challenge, the inspiration came when I glanced on a dish that was shared on FB. I was so taken in by that, that I had to google it right away to see what it was. Infact I joined the group just to know the name of the dish. I was told it was Chatti Pathiri. I searched for this recipe right away and was disappointed to know that it was primarily made with meat. Then further search led me to recipes that were vegetarian as well. 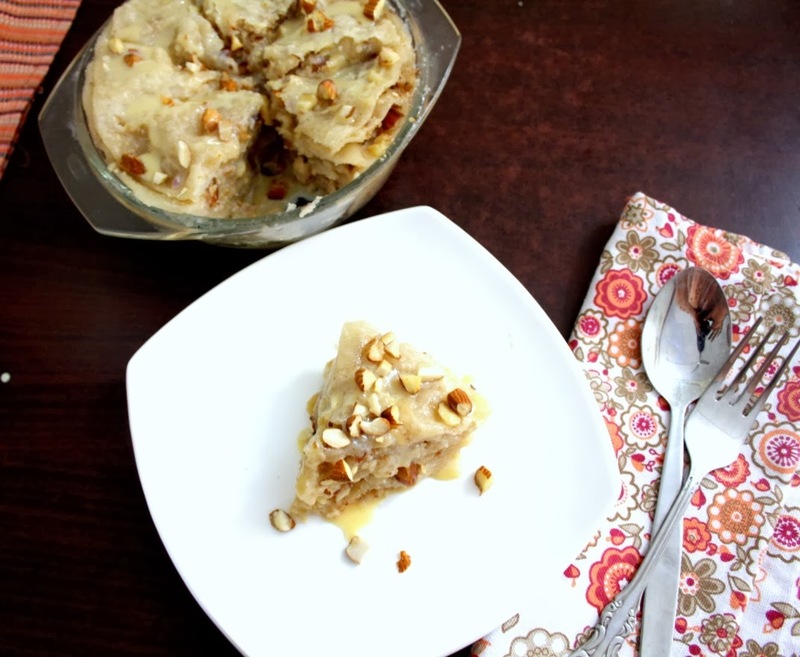 Basically Chatti Pathiri is a layered pastry made in the North Malabar and Malabar region, of Kerala. I was glad to read from Wiki, that this is made in both sweet and savoury variations. The dish is very similar to the Italian lasagna. 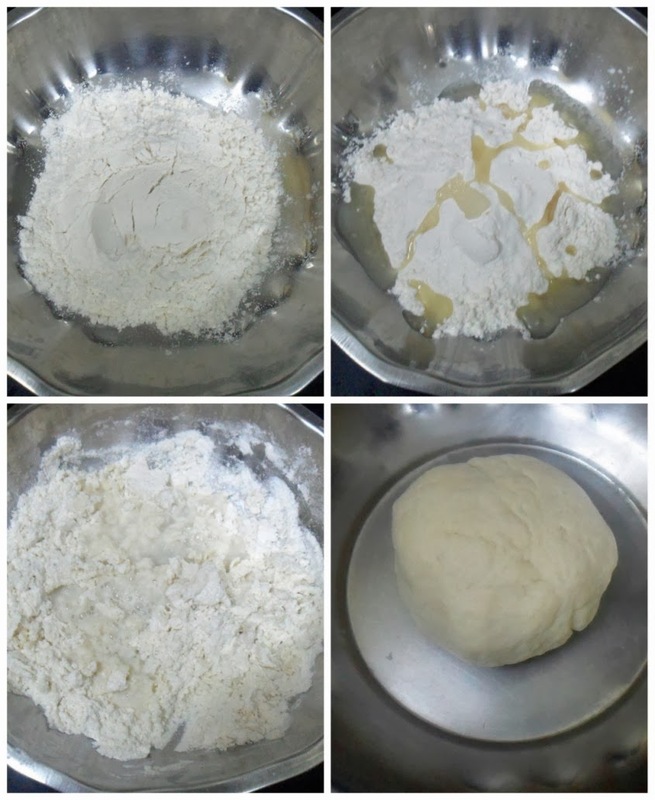 Instead of pasta; pastry sheets / pancakes made with flour, egg, oil and water are used. The filling depends on the variation desired. 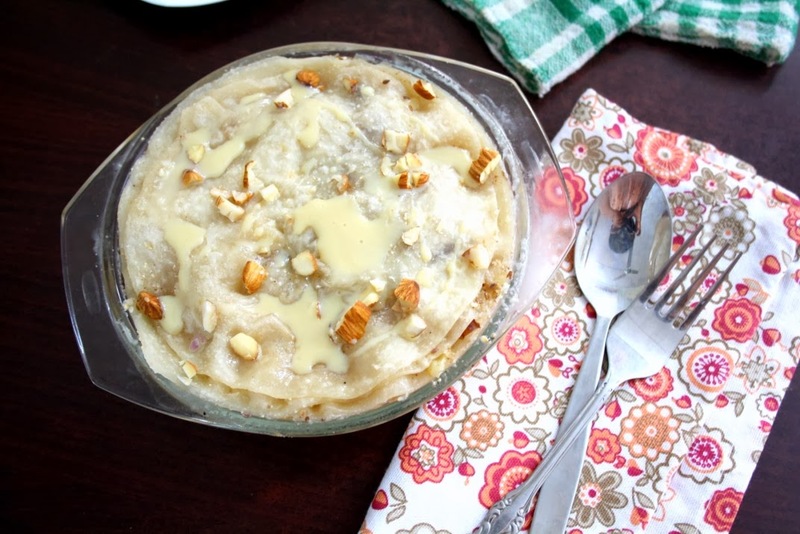 The sweet ones are made with sweetened beaten eggs, nuts and raisins, seasoned with cardamom. The savoury ones are made with traditional meat filling used in making samosas or savoury puffs. The flour is kneaded into soft dough and rolled into thin pancakes. These pancakes are soaked in milk to soften them and arranged in layers. The fillings are added between these layers. 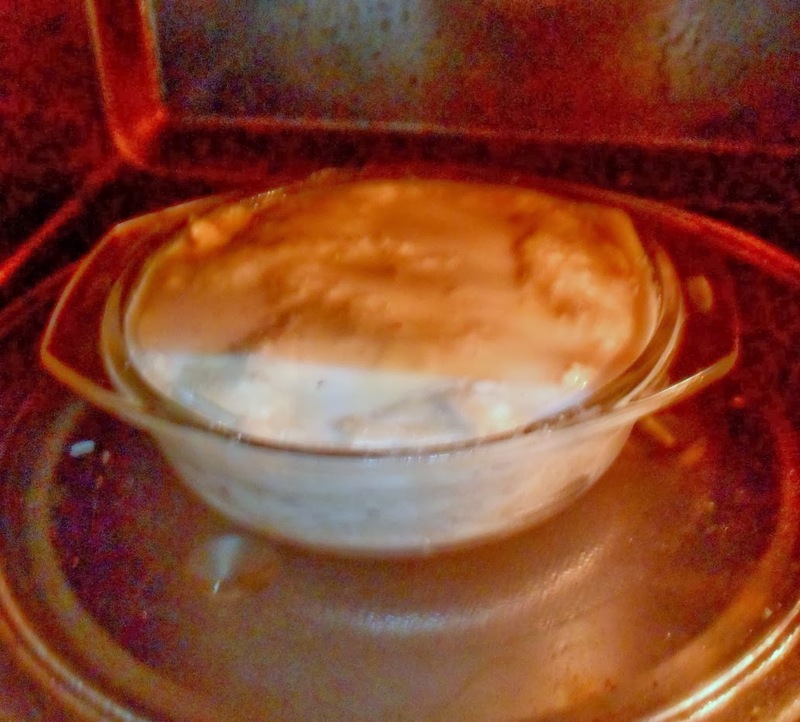 Once layered, it goes in for baking at 180 degrees for approximately 20 minutes. An essential ingredient to enhance the authenticity of the dish is white poppy seeds, used extensively in Malabar cuisine while making biryani and meat stews. It is considered an essential part of any festival, pre- and post-wedding events, and Iftar. Now after knowing that this dish can be made vegetarian and as well in sweeter form, I was all for searching for a perfect recipe. I landed up in Anita Menon’s space called Slice of my lyfe. She had done this challenge as part of an online Food blog event and was forced to look for vegetarian version of this famous dish. Now that’s very convenient as we can easily adapt our challenge from her recipe. So I was all eager to do this for our challenge. It so happened that Vaishali wanted to know if I had shortlisted challenges for the next couple of months. She didn’t want to miss as she was travelling and that’s just the motivation I need to get things shortlisted. I shared what I am planning for the next couple of months. And before she left she had these done and feedback given. Just by the sheer vote she gave, I had to do it. When I was all set to make, especially since the ingredients is mostly available anytime, I thought I should wait for my nephew to visit us, which was during the Diwali. So this was postponed for a week. But imagine trying to make something like this after cooking all three meals, with breaks in between for six elders and five kids. The house was on fire with non stop banter and non stop running around. And by the time I went to bed, it was time to start the breakfast. Just before the day they were leaving, I forced myself to make this. It was pretty late when I finally completed. I had just about 5 mins before leaving for work and all I could think was that I should click the final picture. And in that hurry I completely failed to notice that the dish is white and I used a white plate! Gosh it was only while I was transferring the picture, the realization came, by then I saw the bowl was neatly cleaned and dried as well. So there was no chance for me to even think of clicking it as such. Since I normally make some special sweet for my sweet loving nephew, I declared that this was specially made for him, so he was so happy hearing it and loved this dessert. For a change I was thinking I should bake cakes for him. however I couldn’t make it. Athamma said they saved up two slices for me, and I thought I should take it for my colleagues to taste. Especially with a name like this, I had to share with them. Everybody enjoyed it, talking about the richness of the dish. It was almost like baklava, but with soft layers.I was quite glad that everybody ended up liking this very much. Rolling out the balls for the layers. Each layer gets soaked or dipped in the sweet coconut milk. 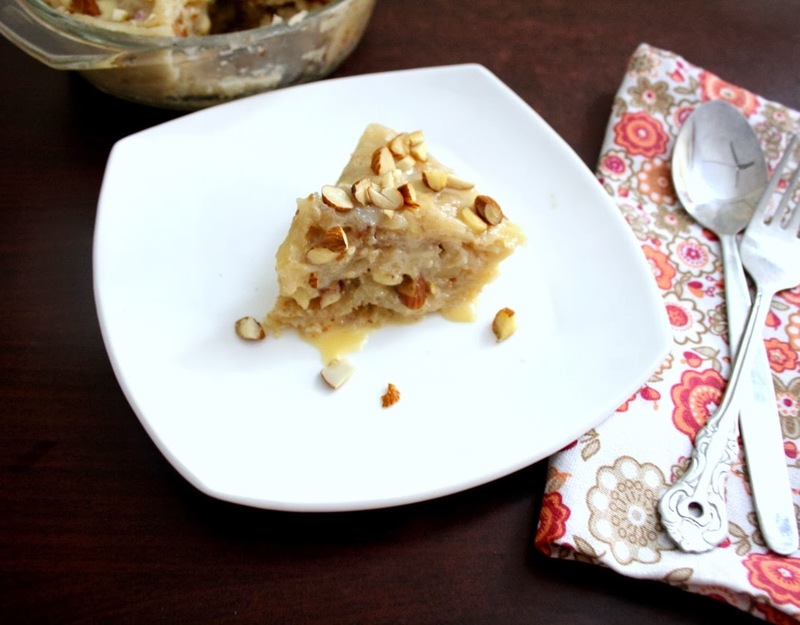 Topped with nuts, condensed milk mix. 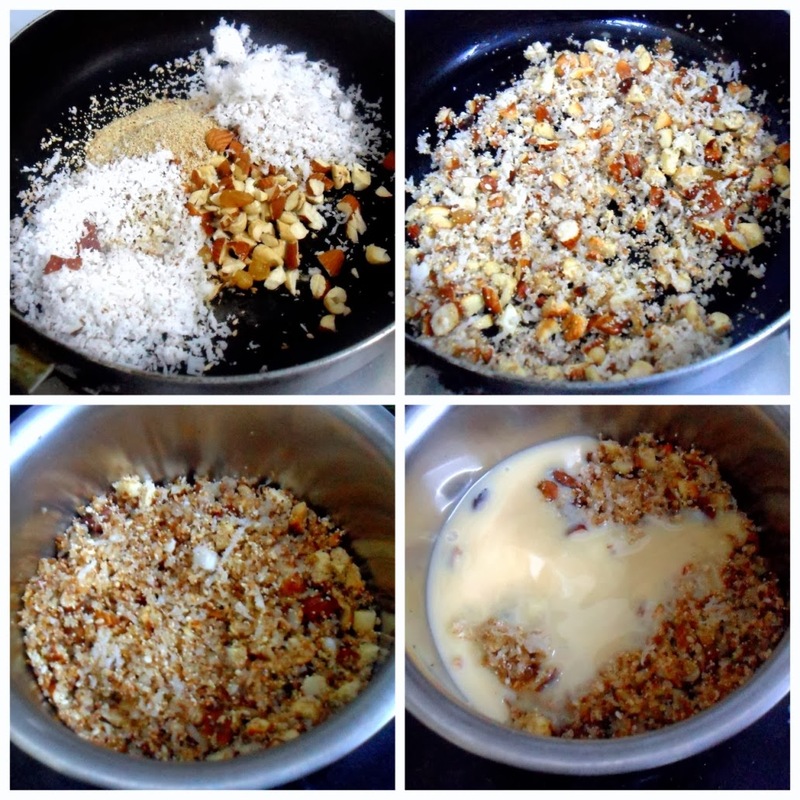 Continue layering alternate with Nuts mix. Finally pour the remaining coconut milk over the top and bake for 15 mins. In a bowl, take the flour, oil salt. Mix well. Slowly add the warm water and using a spoon mix well. Once it is cooled down, mix with hands and add just enough water to knead to a soft dough. Cover it with wet muslin cloth and keep it aside for half an hour. Once you are ready to roll out, knead again and divide the dough into 8 equal portions. 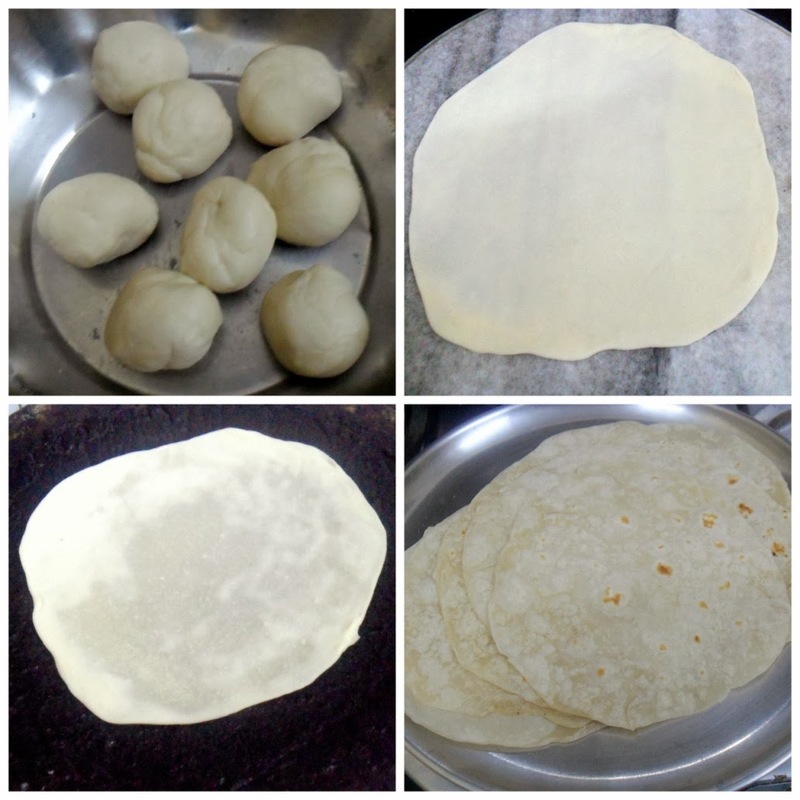 Dust with flour and using a roller pin, roll it out into paper-thin chapatis/round flat bread of uniform size (6 Inches inches diameter) on a dusted flour board. Heat a griddle and cook the chappatis/round flat bread lightly on a tawa. Keep them aside. Continue with all the 8 balls and keep it aside. You should be able to get 8 chappathis with this amount. Notes: Depending on the baking tray you are going to use, you can vary the size of the chapati. Though the recipe says you can rest the dough for half an hour, I almost left it for 2 hrs. The rotis turned out quite soft. Heat a non stick pan, add ghee and saute raisins, cashew nuts, poppy seeds, almonds, sesame seeds till seem a little golden brown . Then saute grated coconut along with cardamom powder until they start to change the colour slightly. Mix the above with half a tin of condensed milk and keep aside. Taste to check the level of sweetness. Add more condensed milk if required. Notes: To ensure the mixing of condensed milk with nuts is easy, warm the condensed milk in MW for 30 secs – 1 min. 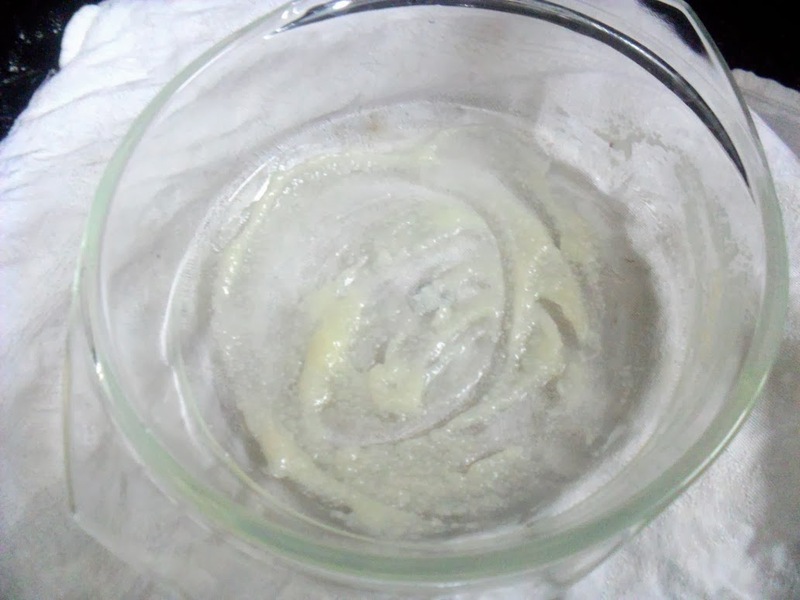 The condensed milk will flow easily and you will be able to mix it well. For the coating, cut the fresh coconut into small pieces and grind to a smooth paste with enough water. Then squeeze out the milk as you normally do when extracting coconut milk. Mix with sugar and keep it aside. 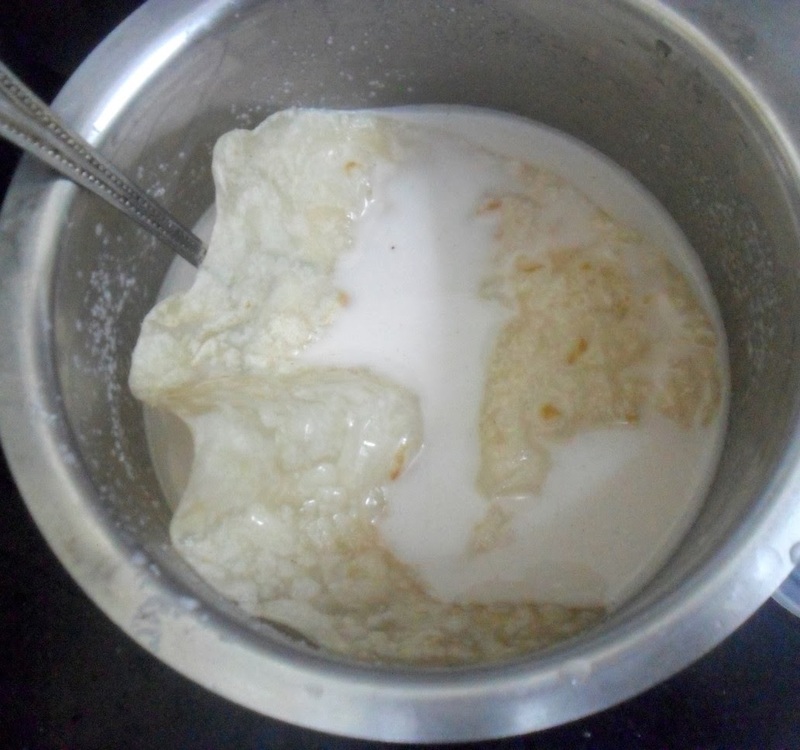 Notes: Original recipe calls for powdered variety of coconut, where you can get the milk by adding hot water to it. 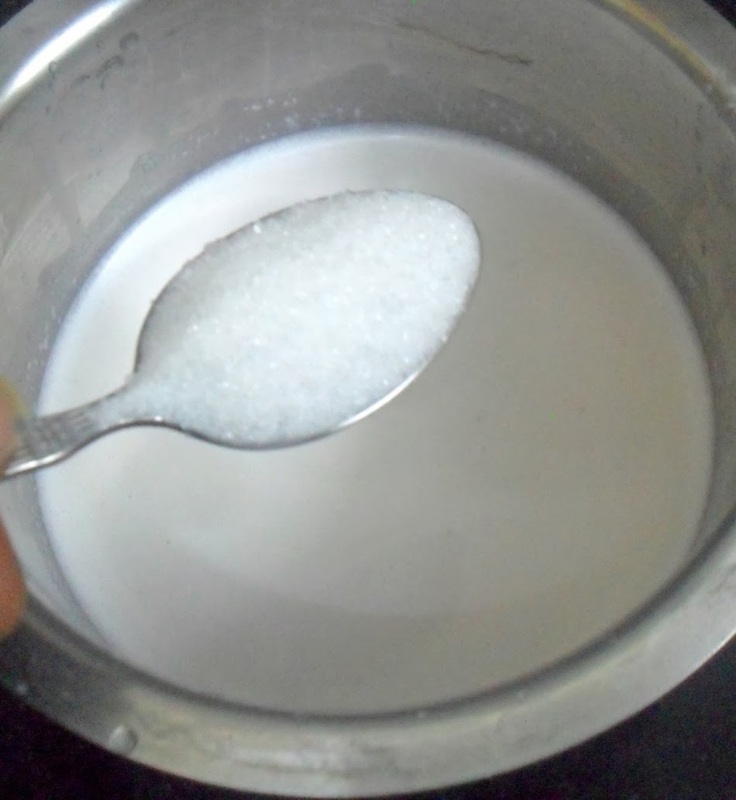 Instead of regular sugar, I added castor sugar to quickly blend it. Else powder the sugar for mixing it easily. Suggest you make the milk just before assembling. Take a baking tray, or a deep skillet and spread couple of tsps oil or ghee to coat all over the bottom. 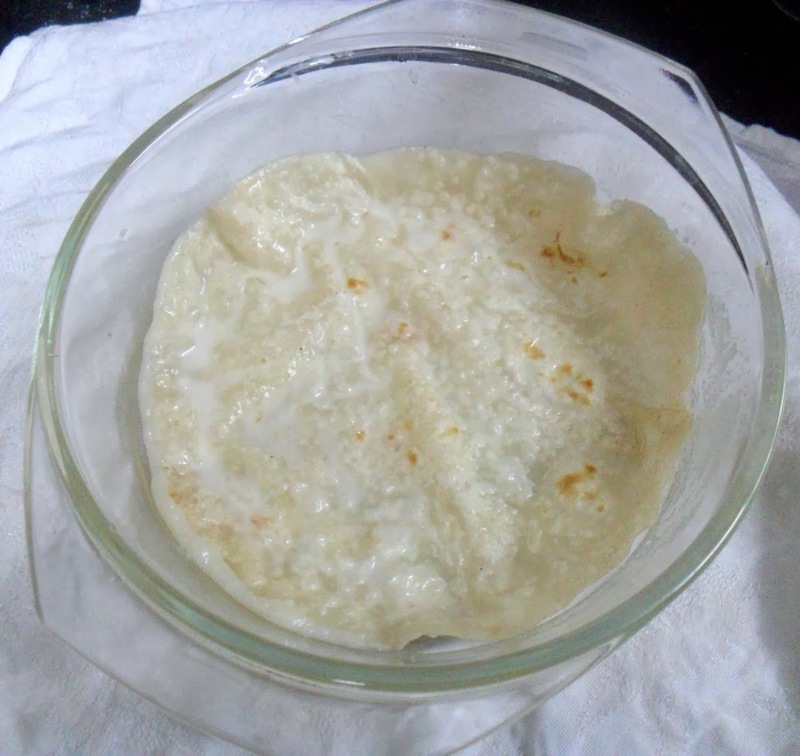 Keep one pathiri/flat bread as the first layer. 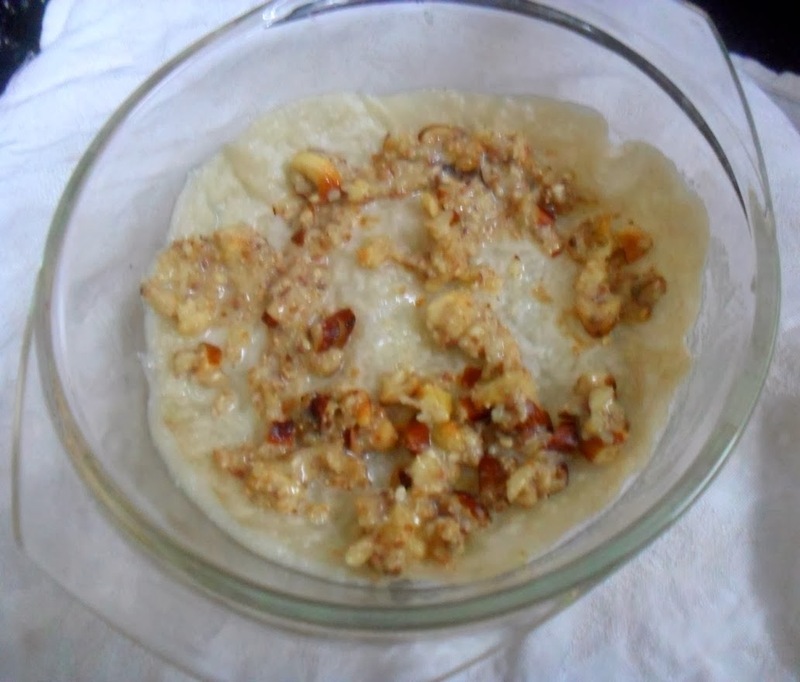 Using a spoon spread the nut mix filling on top of the pathiri/flat bread. Now for the next layer, dip the second chappathi/flat bread in the coconut milk mixture, coat well and place it on top of the filling. Once you place the coconut milk dipped layer, spread the nut mix again. Repeat the process of placing coconut dipped rotis over nut spread and continue with all the rest of the seven rotis. Make sure your top layer is the roti. 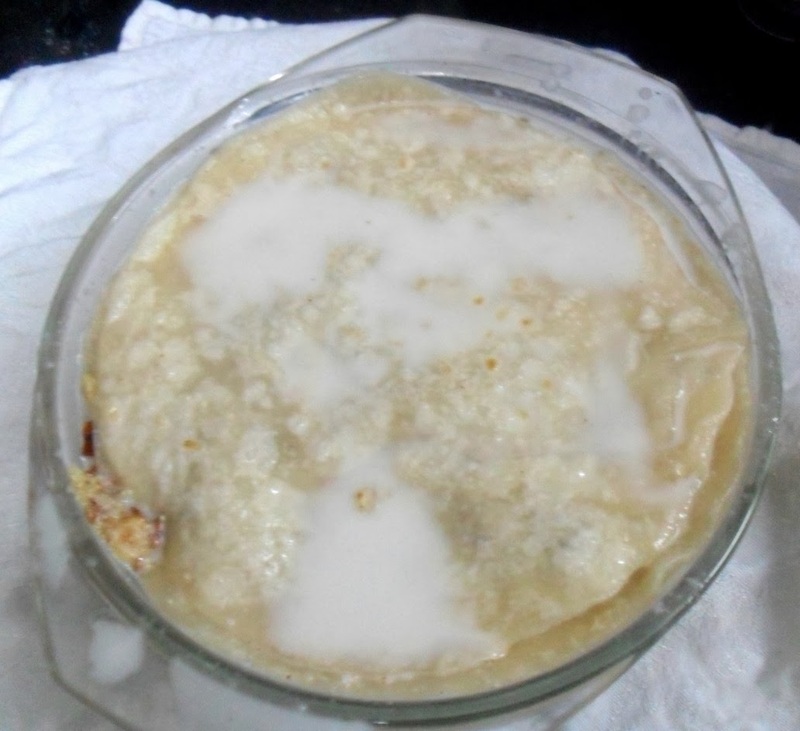 Pour the remaining coconut milk mixture on top of pathiri (a generous amount) so that it drains on all the gaps on sides and form a thin layer on top. This is important to keep the Chatti Pathiri moist. If you run out of the coconut milk mixture after coating, make more and mix with sufficient sugar and cardamom and pour on top. Notes: The rotis won’t seem to soak up the coconut milk, until batter ones. Still you dip well and soak for couple of minutes. When you handle the nut mix, make sure you spread out even for all layers. 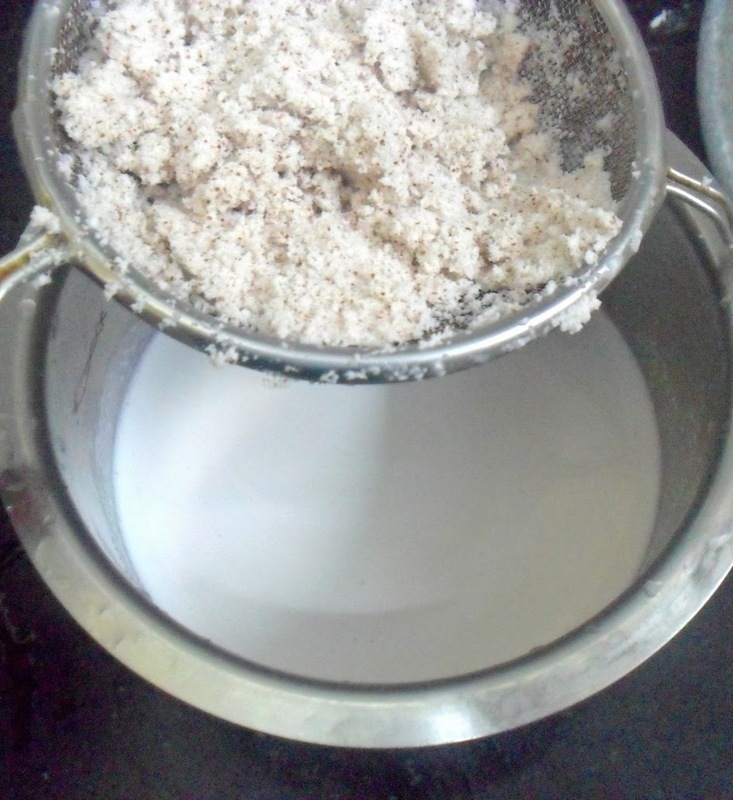 If you run out of coconut milk, extract more or mix more powder, depending on which one you are using. If you are baking in an oven, bake for about 15 minutes or until the top of pathiri turns golden. Alternately you can also this on a stove top in a non stick deep skillet or deep pan. All you have to do is to place it at a very low flame and flip it carefully to cook on the other side. This is quite tricky as you will have to flip on the other side to make sure it is cooked evenly. The flipping becomes a bit easy when the lowest layer of flat bread/pathiri is a little hard. When both the sides have cooked well, it is easy to slide it out of the pan into the serving plate. Drizzle it with some more condensed milk and decorated it with pitted nuts / cherries. Notes: It took me some time for the pathiri to brown on the top. I baked it for another 5 mins. Serve it always warm, slice it with pizza cutter. 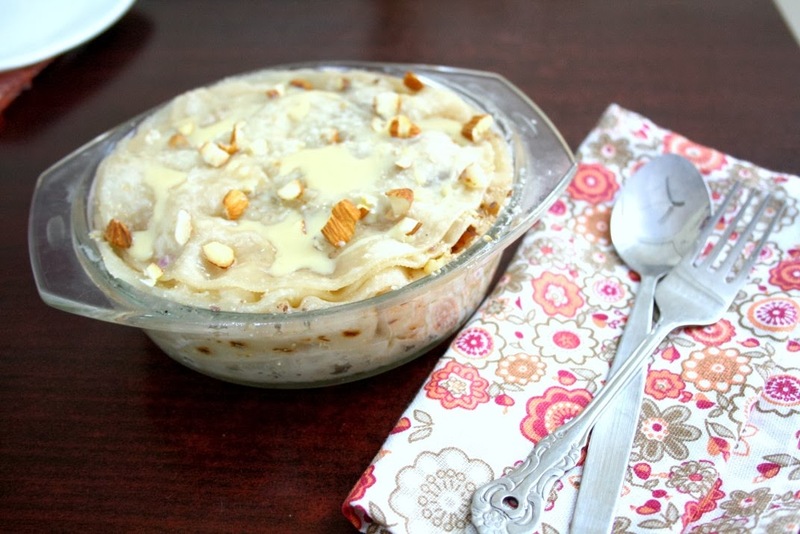 Everybody enjoyed this treat, with so much of nuts and condensed milk it was only natural that it turns out to be a rich dessert. This is best served warm. I hope you make this and enjoy! The pics looks wonderful …well done Valli ! Loved making this dessert Valli. Our very own Indian style baklava — it tasted just so good. Thanks for choosing this dish for ICC. Wonderful and tasty challenge Valli. Loved every bit of it! looks so good – OMG – I still plan to try to sneak it in within the next few days but I am cooking for a dinner party tomorrow night – I'll try!